This ring is formed from a single piece of silver sheet cut and twisted. 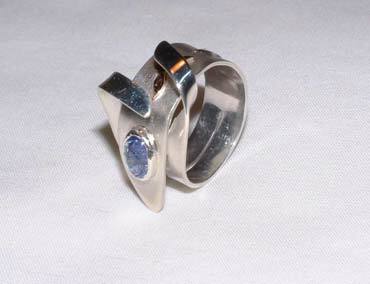 The iolite stone is set with a silver bezel and an open back. Two 9ct gold motifs are layered on the band. The silver ring band is satin finished on the outside and polished inside including where the inner surface folds around to the outside. The gold motifs and bezel are hand burnished.